As Esports silently continues to grow as the fastest global sport in the world with projections to reach $1.5B by 2020, Atlanta-based, RIISE Ventures decides to “get in the game” with its first esports investment in Axis Replay–a premier entertainment and event facility for video games and esports. Together, RIISE and Axis Replay will curate some of the most unique gaming experiences the country has to offer. RIISE Ventures curates experiences by leveraging major sports, entertainment, and technology events [and venues]. Their proprietary Innovation Is A Sport process helps to advise partners and consult corporate brands on how to stimulate ideas, attract and retain talent and invest capital into growth industries companies. Axis Replay CEO Allie Young saw the potential for Esports as a commodity early on in its development. With Atlanta being one of the ‘Top 3 Best Cities for Gamers in the US’ according to WalletHub, and a melting pot of millennial energy, Young felt that it was important to provide gamers a community-driven atmosphere to encourage the industry’s growth. “With the growth in Esports and gaming, investing into the infrastructure that will house, train, and develop digital athletes is something that wise investors will seek. Here at Axis Replay, we’re incredibly blessed to have the backing of such a strong network this early in the game. It’s a testimony to the strength of our concept,” Young explains, “When both gamers and supporters like Sig Mosley put their names behind something, we know we have something extremely special.” Having previously owned her own media and marketing company, Young founded Axis Replay and opened it to the public on New Year’s Eve of 2018. Before it’s Beta Launch, Axis Replay came together with RIISE Ventures to help host the first-ever ‘Esports Week Atlanta‘ in November 2018. This event brought together Esports industry leaders, brand executives, and gamers alike to demonstrate the evolution of the industry through a week of workshops, panels, and tours. 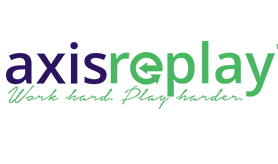 “I’m excited about our partnership with Axis Replay. The Esports space is electric and one of the most fertile verticals for us to create Experiential IP and content right now. We feel what SOHO House is for industry and creative elites, Access Replay will be for gamers and the creative tech space. Adding this to our conversation & portfolio is a win-win for everyone involved.” says RIISE Venture Partner and ONE Musicfest Founder, J Carter. The future of RIISE Ventures’ partnership with Axis Replay is pivotal as Atlanta continues to become an ultimate destination for the largest events in sports, technology and entertainment. “These alliances will allow us to continue to showcase how innovation is a sport and what that means for the industry,” says RIISE Venture Managing Partner M. Cole Jones. RIISE Ventures will continue to explore investing ideas, talent and capital across the esports and other industries that offer distinct experiences in the worlds of sports, entertainment, and technology. Game On!